Quick Take: The Big Bang Theory, "The Pulled Groin Extrapolation"
Review: The Big Bang Theory, "The Pulled Groin Extrapolation"
(S0503) Amy has to go to a wedding but doesn't want to take Sheldon because he'll act like a baby, so that leaves Leonard. Since she'd had such a good time hanging out in his apartment while everyone else went out, it seemed natural. At the wedding, she does her best to get him to loosen up, and when she does, he manages to pull a muscle in his groin. She takes care of ice and gets him home, and he thanks her with a kiss on the cheek, which she takes to mean he's falling for her. In the apartment, Sheldon hears the word 'groin' and assumes the worst. Meanwhile, Sheldon has discovered that smaller and smaller train sets are more and more fun, and Howard convinces Bernadette to stay over for a weekend to see how she could handle living with his mom when they get married. Bernadette hates every second of it, but by the end, she's starting to sound just like her...and that doesn't bother Howard at all, because of his weird closeness to his mom. Which is starting to get really creepy. But is also comedy gold. But mostly creepy. I hope it isn't a matter of waiting for Bernadette to get sick of it and leave, because she's great. Amy is front and center this ep, and she's great fun, with all the best lines this week. It took a long time to get to the pulled groin in question, but it's like one of those story jokes: the rest of it is worth the punchline. And in this case, it was almost literally a punch, since Sheldon reacted so strongly. And it was a totally emotional reaction, too, which can be rare for Sheldon. Awww! He does care about Amy! All in all, a fun, silly episode. The bathroom humor was a little more pronounced than usual, but the progression of Howard's mom from screaming harpy to weirdly supportive continues, though still they aren't forcing Howard to take care of himself or grow up. Sheldon got to have a whole episode of being a kid, which was sweet. Penny made the best faces as Amy was telling her what happened. Leonard remembered what it's like to have fun. And everyone seems to be back on friendly terms. Just like old times. Watch full episodes of The Big Bang Theory at CBS.com. It was nice to see Bernadette in this episode; I missed her. 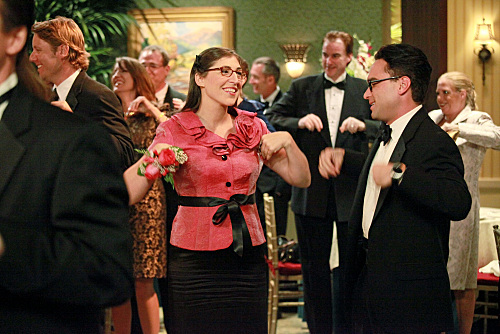 It’s interesting that Amy Farrah Fowler (it only seems right to write the whole name) feels comfortable enough to stay with Leonard when he’s home. She reminds me of myself since one of my pastimes is starring into space. Nothing beats watching my DVR recording in HD though because I have a big TV and I need the best quality. My DISH Network employee HD receiver gives me the best quality possible and the programming is totally free thanks to DISH. I had qualified programming as a qualified customer and the HD is free for life.